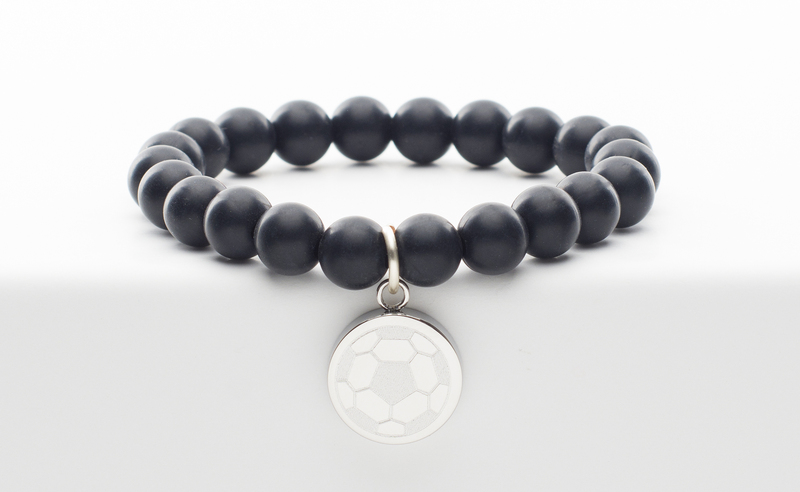 Surprise your favorite soccer player with her very own RC Girls Cate Soccer Cuff! It has black soft silicone beads that make it perfect for little girls. It also includes a silver pendant engraved with a soccer ball. RC Girls Cuffs are made with an elasticized band to fit most girls from ages 5 to 9 years. Order Deadline: February 28, 2017. To order using a credit card, see below. To order using cash, see order form here. All Sales are Final. BASC Rustic Cuff Bracelets will arrive approx 6-8 weeks following the order deadline, near the end of April. Once the bracelets have come in we will contact you to come pick them up. Shipping is available for $6 for up to three cuffs. If you would like to have your order shipped, please email your name, shipping address, phone number and order details to info@bascok.com. We will email a PayPal invoice to you to pay for the shipping cost. Proceeds will go to help BASC maintain game and practice fields, provide training and resources to coaches and referees and provide financial assistance to our players. Thank you for your support of Broken Arrow Soccer Club. Payments made via PayPal below using Visa, MasterCard, Discover, Debit Card, American Express. Cash payments may be made at the BASC office during business hours. Exact dollar amount required. All Sales are Final; no refunds or exchanges. Should your item suffer from a manufacturing defect, please contact Rustic Cuff.